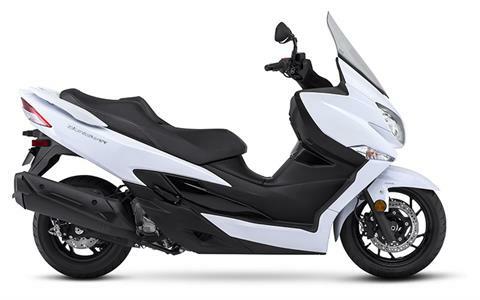 Already renowned as a premium, feature-rich scooter, the Suzuki Burgman 400 is all-new for 2018. 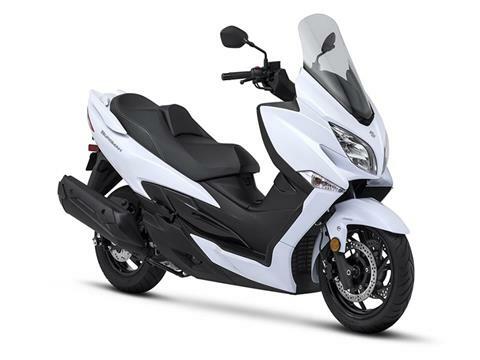 The new Burgman 400 retains the key features that made this luxury scooter popular through the years, while combining improved chassis and engine performance with a sleek new, athletic body. The 2018 Burgman 400 establishes a new convenience and performance standard for mid-sized scooters while maintaining its highly regarded reputation for luxury, quality, comfort and running performance. The result is a more desirable Burgman 400 that truly delivers a winning combination of style, performance, practicality, convenience and riding enjoyment. Pillion rider footrests provide comfort, letting the passenger feel planted and relaxed, even during extended rides. The comprehensive and easy-to-read instruments incorporate an analog speedometer and tachometer plus a LCD display that provides odometer, twin tripmeter, clock, ambient temperature, average fuel consumption, fuel level, and coolant temperature readings. Other colored LED indicators provide turn signal, headlight, freeze and service function alerts. The Burgman 400’s new underbone frame is constructed from large-diameter, thin-wall tubes that result in lower weight and increased rigidity, resulting in improved handling. Telescopic 41mm inner-tube front forks with a generous 4.3 inches of wheel travel, and the link-type mono shock absorber rear suspension has adjustable 7-way preload to deliver motorcycle-like handling with exceptional maneuverability. A new, larger 15-inch front wheel replaces the 14-inch wheel of the prior model to improve stability and enhance the visual appearance. The new front wheel carries a pair of 260mm disc brake rotors while the 13-inch rear wheel has a 210mm hydraulic disc brake for reliable stopping control. The standard Antilock Brake System (ABS)* monitors wheel speed, and matches stopping power to available traction. A new compact ABS control unit weighs 1.6 pounds less than the prior model. An easy-to-operate, T-handle parking brake lever is located on the dash near the ignition switch, to prevent rear wheel movement when engaged. The new upswept windscreen has a cleaner, more compact look from the front or sides while delivering optimum wind protection and a clear view of the road. The new bodywork conveys the luxurious, performance nature of the Burgman 400. The slimmer, sportier and more agile look matches the scooter’s personality. The slim new rear deck of the Burgman 400 features independent LED rear combination lamps with the turn signals at their tips. It’s a sharply sculpted design that expresses elegance and agility. The new nose features sharply styled dual LED headlights with integrated LED position lights and turn signals mounted beneath. The resulting effect is that of a cleaner and lighter front end that is instantly recognizable as belonging to the Suzuki Burgman family. The new stepped dual seat has nearly an inch thicker padding for more comfort. The width and profile is slimmer to add comfort for both the rider and passenger. The cover features double stitching and accent piping to further extend the look of luxury. To increase comfort, especially on longer rides, the seat incorporates a rider’s backrest that is adjustable by 0.5-inch or 1-inch fore-and-aft at the press of a lever. The combination of the seat changes and floorboard position creates a more upright riding position that is more comfortable and sportier for the rider. The CVT (Continuously Variable Transmission) provides smooth, linear, practically shock-free power delivery for comfortable riding at any speed riding. Updated 399cc liquid-cooled, four-stroke, DOHC, single-cylinder, fuel-injected engine produces greater low-to-midrange torque and more powerful performance, even when riding with a passenger. DOHC 4-valve arrangement allows ideal positioning of the intake and exhaust valves for superior mechanical advantages and efficient combustion. The benefits can be felt in smooth, instantly available acceleration. The highly efficient new engine, which employs a new, long-life iridium spark plug, takes advantage of the scooter’s lower weight to improve fuel economy and extend the riding range of the generous 3.6 gallon fuel tank. 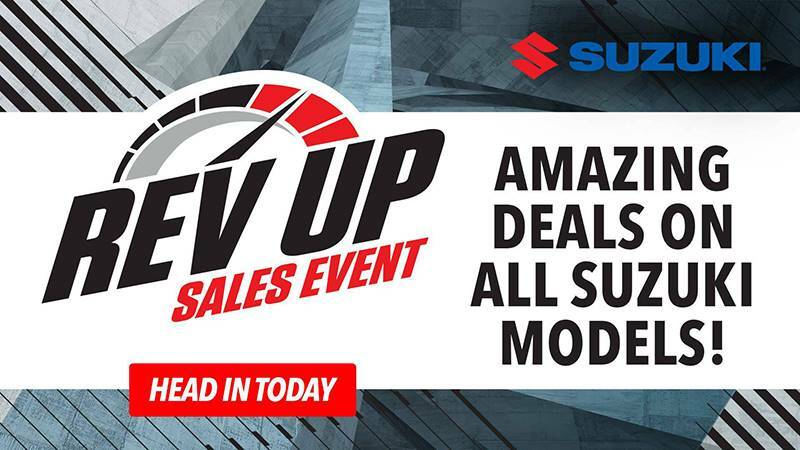 The refined Suzuki Fuel Injection system with O2 feedback plus the Pulsed-secondary AIR-injection (PAIR) system and catalyzer-equipped exhaust boost fuel efficiency and help the Burgman easily achieve emissions compliance. The new 5-liter air cleaner assembly is 10% larger to aid throttle response and boost acceleration in stop-and-go traffic. Located under the seat, it has also been designed to emit an exciting intake sound.